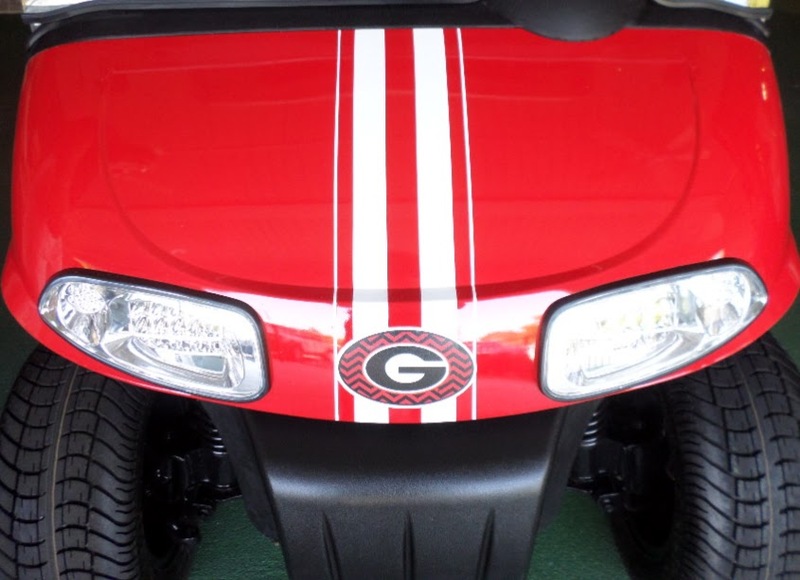 Add golf cart decals of your favorite sports team or try simple pinstripes and flames for a custom golf cart look. They are an easy and inexpensive way to customize your golf cart body. 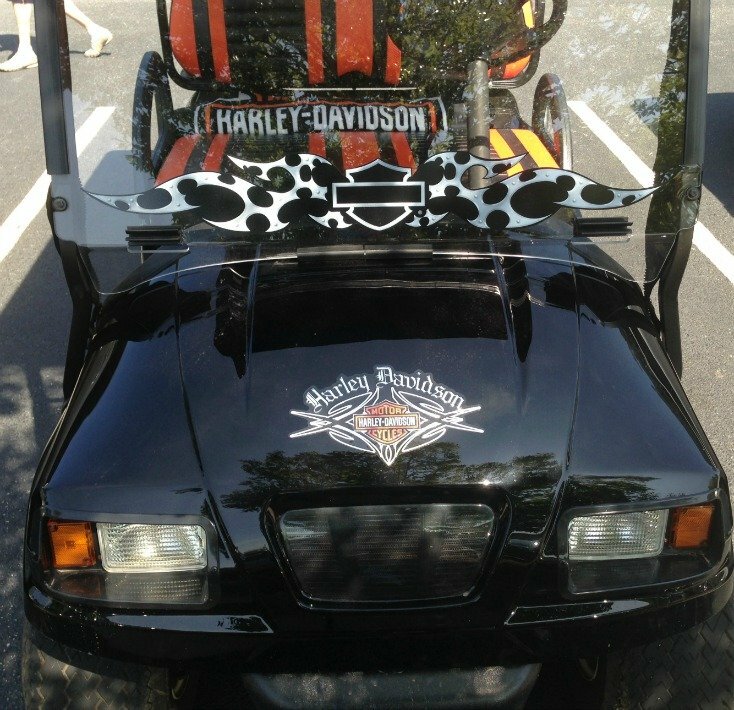 Here's an example of someone who is a Harley Davidson fan and makes it loud and clear through decals and color coordination. You can choose from race car decals to NFL decals or for some flare - add the flame decals. Some decals are black and white while others are colored. You can add a racing stripe decal down the front cowl of your cart for a unique and custom look. Place decals on the front or sides of the golf cart to show your support of your favorite baseball team. Amazon carries a nice selection of flame and pinstripe decals to customize your golf cart. They are made of heavy-duty weather-resistant vinyl. If you want the look of a custom graphics paint job without the price, try one of their decal sets. 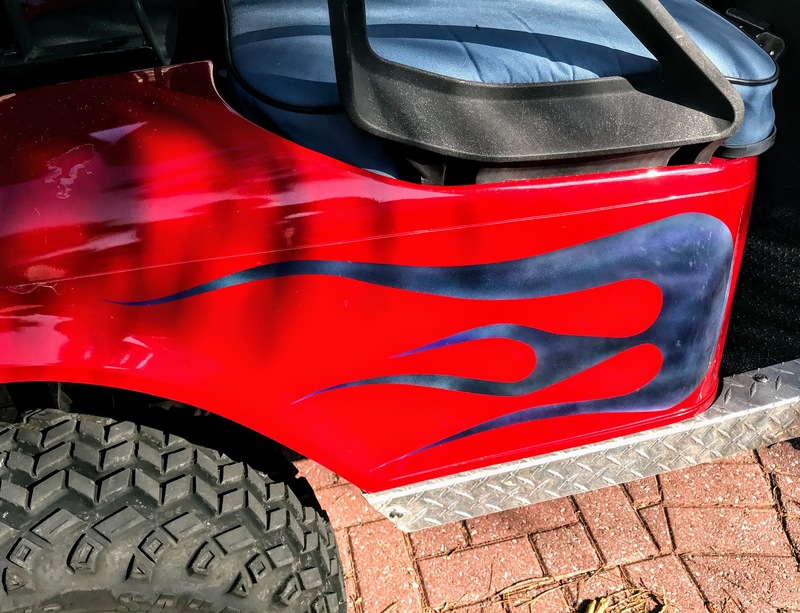 For those who want to customize their entire golf cart body there are pre-cut golf cart skins or wraps. Applying these pre-cut pieces is so much easier than buying the rolls of skins and cutting them yourselves. This one is specific to Club Car DS models. These kits are made from highly durable, ultra pliable, wreck-proof vinyl. Once the graphic is applied with their triple-layer 3M brand adhesive - they will not come off. The thickest layer of scratch-proof clear vinyl over laminate for an Armor Like layer of protection makes it durable and scratch resistant. They are available for Club, EZGo and Yamaha golf carts. 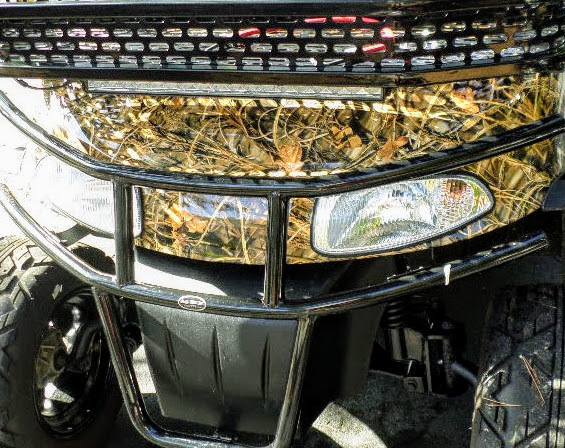 There are 13 Mossy Oak patterns to choose from if you want to change out your golf cart paint color to a camouflage golf cart wrap. Made of highly durable 3M vinyl, the wrap is guaranteed not to fade, shrink, peel or crack in the outdoor elements for up to 5 years. Applying golf cart skins takes patience and precision. Be sure your cart is super clean before you start. You will need a heat gun, an Exacto knife and an extra set of hands. 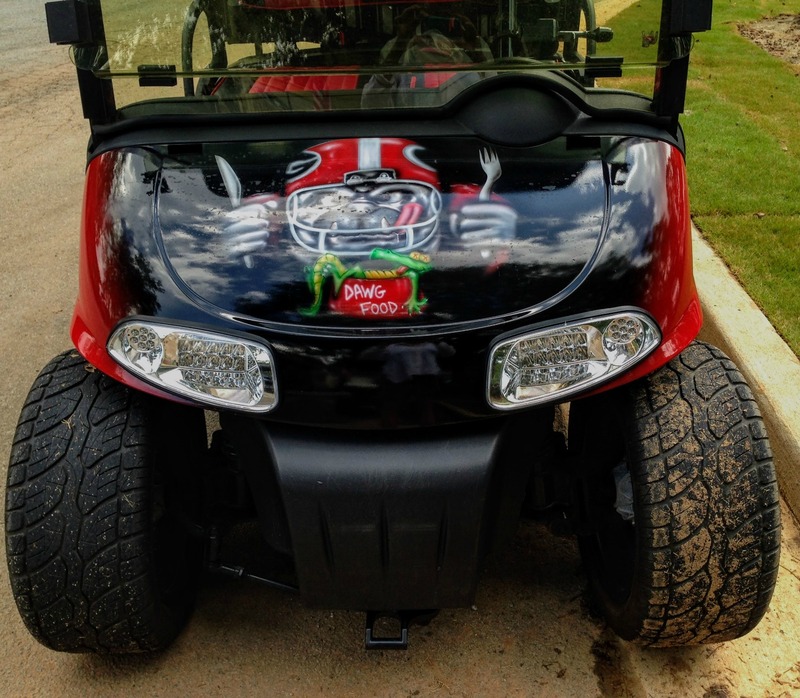 College football decals can be used as golf cart decals to customize your golf cart. They can be easily placed on your golf cart - on the front, back, sides or windshield. These can be bought just about anywhere and are not specific to golf carts. 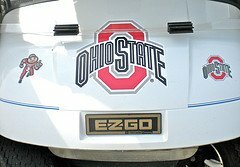 Display your favorite college or college football team with a college decal and display it proudly on your golf cart. 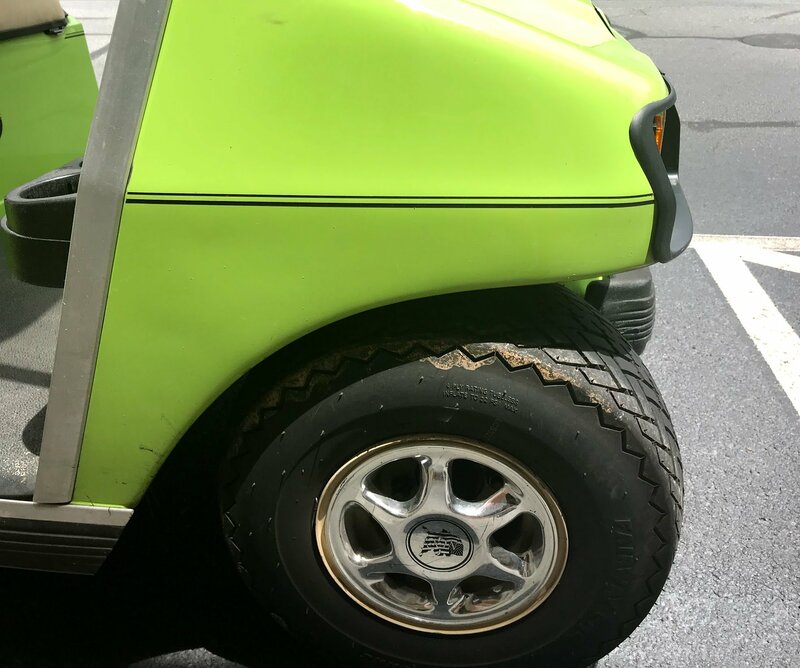 These peel and stick golf cart decals can be placed on the front or sides of the golf cart.